A Superman story with an unusually overt political theme has some Conservative comic book fans up in arms. Superman's classic line about "truth, justice, and the American way" is going to need a little tweaking, as in Action Comics #900, he renounces his US citizenship to take a more global prospective. This news has not gone down well in some quarters, especially with readers of Fox News' Nation blog. Issue #900 actually contains a number of different stories, even one where Superman fights an actual god, but it was a politically charged piece by Batman Begins writer David S. Goyer that has people upset. In it, Superman intervenes in a anti-government riot in Tehran, Iran's capital city. He protects the protestors from Iran's army through what is described as, "an act of non-violent protest." The story is unusual in that is uses real places and people - Iran's president Mahmoud Ahmadinejad appears in the story - rather than stand-ins. After protecting the protestors, Superman returns home where he is confronted by US Government officials. It's there he reveals his intention to give up his US citizenship, saying that the world is too small for him to be tied to any one country, and that he was tired of having his actions seen as "instruments of US policy." Fox News wrote about the story twice, once in long form its main blog, and a short synopsis on its Nation blog, which linked to a story written by Wired. 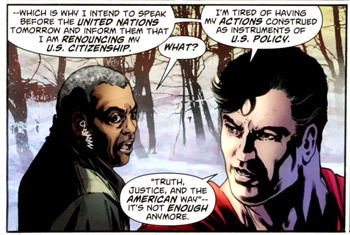 Despite what you might expect a Fox News piece on Superman turning his back on the country that had given him so much to be like, both pieces are incredibly even handed, free from the hysteria and half-truths that characterized its Bulletstorm coverage. In the articles' comment sections, however, it's a different story. Many readers are upset with the story, which they perceive to be an effort by left-leaning writers to push their agenda, using Superman as a platform. "The liberal, America hating scumbags who now run DC Comics are just adding another feather in their cap with yet more anti-American culture and tradition jihad. F--k 'em," wrote one commenter. "This is why I don't go to movies or even rent anymore. I'm not making the left loons of Hollywood any richer to support their campaign of American hate," added another. DC co-publishers Jim Lee and Dan DiDio were diplomatic about the story, issuing a statement seemingly intended to support it, while at the same time, placating its detractors. In it, they said that that Superman embodied the very best traits of "the America Way," and that despite his new, global focus he would remain true to his roots as a farm boy from Kansas. Unfortunately, it seems unlikely that this measured response will be enough to mollify those who see this as a betrayal of what the character used to stand for.